Kuchen literally means ‘cake’ in German and many popular versions of kuchen are made topped with fruit and a brown sugar mixture. This recipe is the best I’ve tried and is one of those cakes that’s easy to make and foolproof to impress. There are many forms of kuchen, which is German for ‘cake’. My recipe, like many varieties, is a custardy cake dessert, with a sweet dough, topped with fruit and buttered sugar and spices. When searching the list of ingredients for Kuchen, the recipe seems pretty basic and common. Butter, sugar, egg, flour, leavening, and sour cream. Basic, right? But combined and then topped with fabulous fruit, spices, and sugar, it’s anything but basic and is, in fact, super moist, flavorful, and delicious. And incredibly easy. The cake component in this kuchen recipe, when baked produces a buttery flavor with a melt-in-your-mouth custard-like center. Baked in a 9×13-inch pan, the cake turns out with nice, crispy edges too. 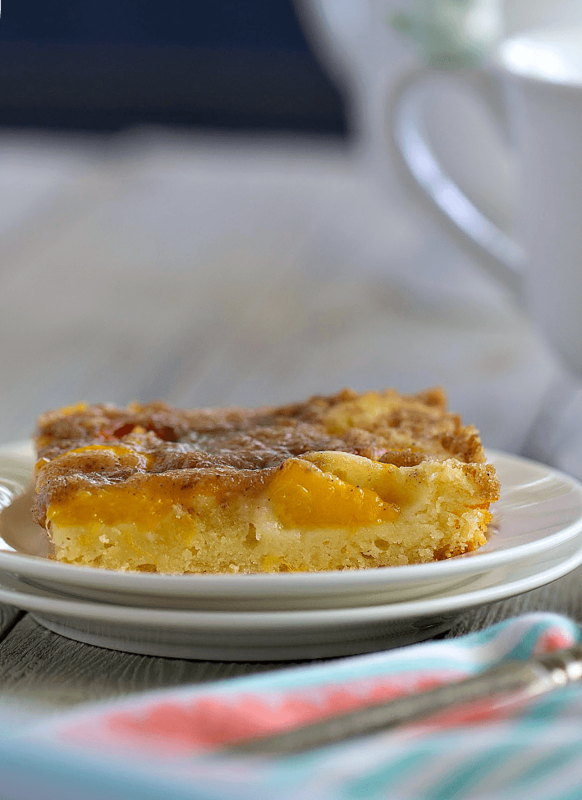 A tiny bit of almond extract brings a warm note to the kuchen that highlights the fruit and spices on top. Speaking of the fruit topping, I used fresh peaches (frozen will do just as well), but you can also use blueberries, plums, pears, or a combination of any of them. After the batter is poured into your baking pan, the fruit is sandwiched between a not-quite streusel-like mixture of butter, sugars, flour, cloves, and cinnamon. This mixture helps to create the custardy portion of the cake as the fruit breaks down a little and the sugar and extra butter melt into the batter. The topping doesn’t get crunchy, really, but it’s truly divine. I was nervous about the cloves overpowering, albeit only a quarter teaspoon gets added to the topping. When first taken out of the oven and tested, the cloves are pretty pungent, but give it a couple hours, and it becomes just perfect and actually helps highlight the cinnamon, butter, and fruit. If you want to serve the Kuchen warm out of the oven, feel free to reduce the cloves by half. 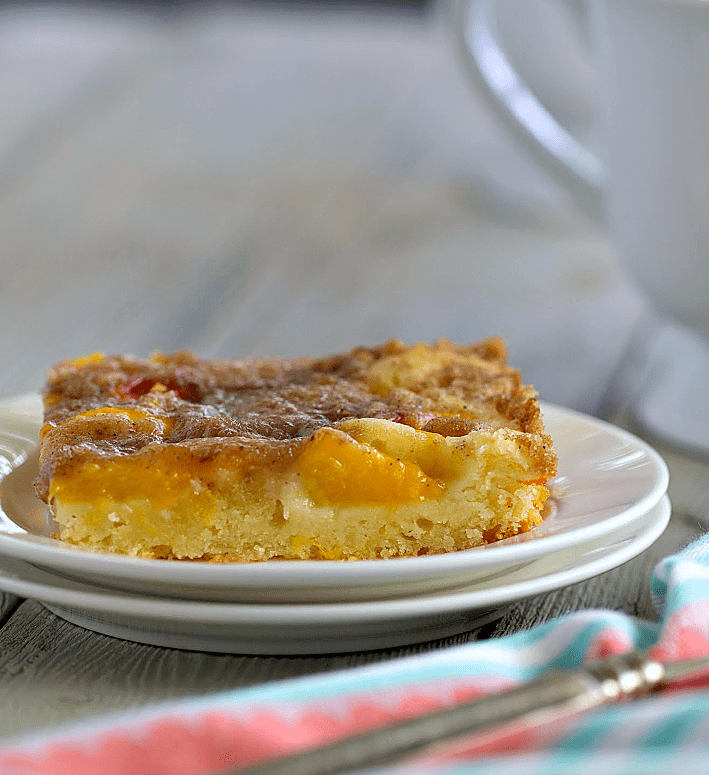 I recently took Kuchen with peaches to an appetizer party and it was an instant hit. The first person who tried it could be heard to say “Be sure to try this!” and it disappeared quickly, with many requests for the recipe as they all tried to dissect the cake, with ooh’s and ah’s over the moist texture, and perfectly balanced flavors. So, if you need something quick, easy, but Wow!, this recipe checks all the boxes. Kuchen is excellent as a brunch or coffee companion, and it also makes a great dessert following a winter stew or chowder dinner, not too filling, but absolutely satisfying. I’ve been asked if the Kuchen could be made using apples, so I’ll be giving that a try soon and I’ll update shortly. For now, the best fruit appears to me to be something a little more soft that will kind of melt into the cake. Absolutely! Kuchen freezes very well when covered in plastic and then covered again in a freezer wrap or container. The cake can be frozen for several weeks before defrosting to room temperature to serve. 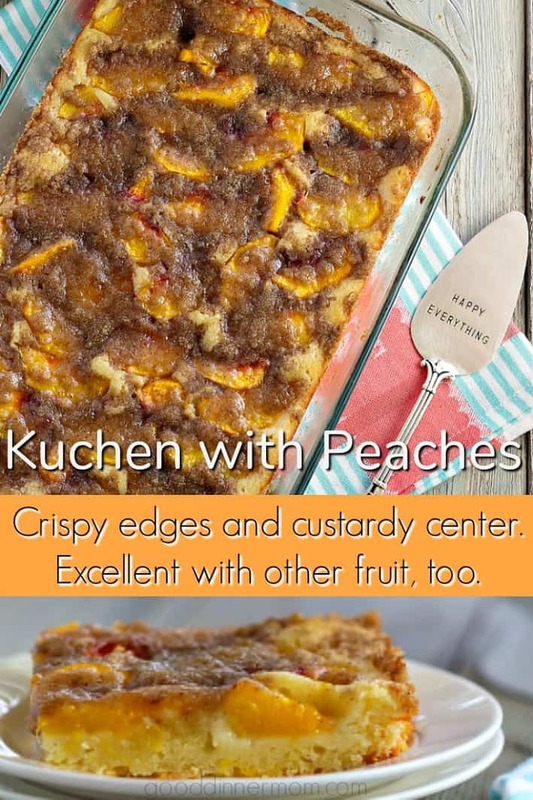 Save Kuchen to your “Cakes” or “Baking” board and let’s be friends on Pinterest! I’d love to share tasty recipes with you. 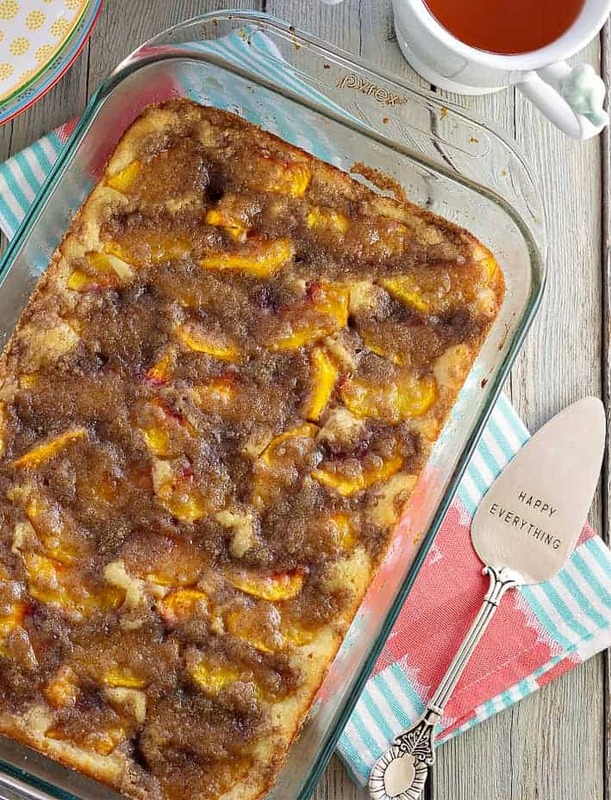 This recipe calls for peaches in the Kuchen, but feel free to use blueberries, pears or plums. Frozen peaches may also be used, defrost peaches before using. Grease a 9x13-inch pan. Preheat oven to 350F degrees. In a large bowl cream together 1/2 cup butter and the 1/2 cup sugar. Blend in the eggs and sour cream. Mix in 1 1/2 cups of flour and the baking powder. Spread the dough in the prepared pan. In a small bowl mix the 1/4 cup softened butter, 1/4 cup of sugar, 1/4 cup of brown sugar, and 1/4 cup of flour, the cloves, and cinnamon. 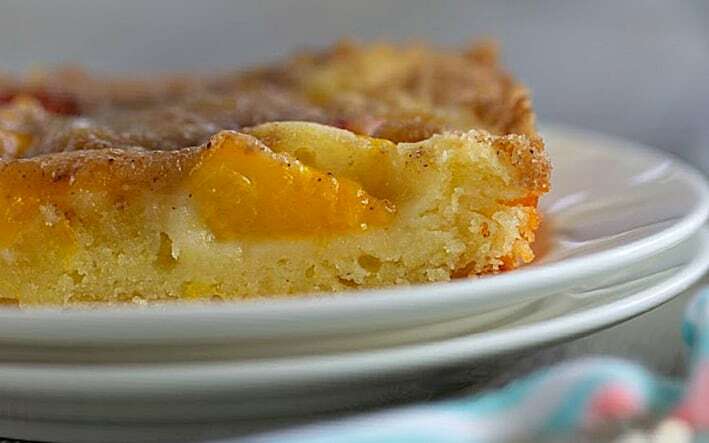 Sprinkle half of the topping over the cake dough, place the peach slices over the entire surface, and sprinkle the remaining topping to cover the Kuchen. Bake on the center rack in the oven for 30-35 minutes. Check the cake with a toothpick at 30 minutes and if it comes out with cake "crumbles" on it, it is done. You don't want a completely clean toothpick because you want the cake to come out kind of wet to get the custard texture throughout the middle of the Kuchen. The Kuchen can be served right out of the oven, but if you let it sit for two to three hours before serving, the clove flavor becomes more mild and all the flavors are melded nicely. Leftovers should be refrigerated in an air-tight container. As mentioned in the pre-recipe notes, you may substitute the peaches for plums, pears, or blueberries. Also frozen peaches work great, but defrost the peaches first so they cook enough to break down and soften. When served right out of the oven, the Kuchen is tasty when warm though all my tasters preferred it after anywhere from three to six hours later. When served within the first hour or so, the cloves are a little overpowering, but the flavor becomes perfect over time. If you want to serve the Kuchen immediately, I would reduce the cloves to 1/8 teaspoon but would not leave them out. This is so tasty. Great texture without falling apart. The peaches were perfectly done. Directions easy to follow!!! Yummy!! Thanks Sonia! All the flavors do come together nicely as the kuchen is baked. Thanks again for stopping by. I love that this cake has a custard-y texture to it – that’s how I love pretty much all baked goods! Definitely trying this one soon! Thanks Lauren, I hope you do give it a try! I agree, custardy texture is my favorite too, especially with when soft fruit and buttered brown sugar are on top. Ohhh that brown sugar topping! OMG I think I could eat that my the spoonful. LOVE that server by the way! So cute! This sounds just incredible! I love cinnamon and cloves, so the topping is right up my alley! Thanks for sharing! That kuchen looks moist and delicious! Just like my Grandmother’s I wish I had a piece right now!